Katherine Kealoha's doctor talked to a judge during a court hearing that was closed to the public. Afterward, U.S. District Judge J. Michael Seabright granted Kealoha's motion to postpone the trial because she says she has cancer. "I think there is a very high likelihood of chance that Ms. Kealoha could not meaningfully participate in the trial," Seabright said. Kealoha; her husband, Louis Kealoha; and current and former officers were set to face trial later this month on charges that they used police resources to frame her uncle for stealing the couple's home mailbox. Prosecutors have accused the Kealohas of using their power to try to destroy anyone who threatened to reveal her financial schemes, which include stealing money from the uncle and her grandmother to support the couple's lavish lifestyle. The Kealohas and their attorneys left the courthouse without commenting. Jury selection for the trial is now scheduled for May 15. It's not clear how delaying the trial will affect another case against the Kealohas on bank fraud, identity theft and other charges. Trial on those allegations was to start in June. 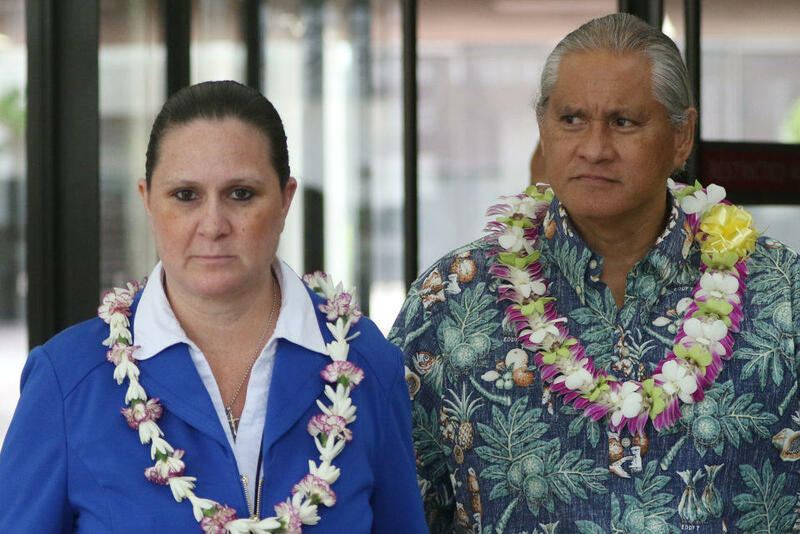 Katherine Kealoha also faces a third trial after she and her doctor brother were indicted on charges that they dealt opioids and used her position as a prosecutor to hide their crimes. Prosecutors say she and her brother, Dr. Rudolph Puana, used cocaine with others in the drug-dealing conspiracy. She and Puana have pleaded not guilty. The widening investigation that stemmed from a peculiar case of a stolen mailbox has grown to include other high-ranking Honolulu officials. Honolulu Prosecuting Attorney Keith Kaneshiro and Honolulu Corporation Counsel Donna Leong have received letters from the U.S. Justice Department saying they are targets in the investigation, but specific allegations have not been made public yet. Leong took a paid leave of absence, while Kaneshiro has refused calls to step down. Hawaii Attorney General Clare Connors filed a petition with the state Supreme Court asking that Kaneshiro be suspended from practicing law. The court gave Kaneshiro until this week to respond. Kaneshiro also is facing a separate petition from a Honolulu businessman who wants him impeached. An attorney representing Kaneshiro has said there's no dysfunction in the prosecutor's office and that Kaneshiro deserves a presumption of innocence. The Hawaii Supreme Court today ordered Honolulu City Prosecutor Keith Kaneshiro to respond to a petition filed by the state attorney general seeking to suspend the prosecutor while a federal corruption probe moves forward. A Hawaii pain doctor and his former prosecutor sister were released on bond Wednesday while awaiting trial on charges they dealt opioids.